After completing the Coast to Coast (Whitehaven to Sunderland) last year my brother Andrew and I decided we would tackle the W2W this year. We decided to opt for the Whitby finish rather than the Sunderland version as we had finished off by riding along the River Wear last year. One of the problems we found when researching the ride was just how little information and accounts from other people were available about this route, certainly when compared to the C2C, so hopefully this account will help others who may be planning to do the W2W. We decided to break the ride down into 3 days of equal distance. The obvious overnightstops for anyone doing the shorter Walney to Wear route are at Kendal and Barnard Castle but for us it would have meant a short day 1 and 2 and a very long day 3. Instead we opted to stay in Orton (although Tebay would be an alternative) as it had a few B and B’s (being on the C2C walking route) and Darlington, as we couldn’t find any other reasonably priced (less than £30 a night) accommodation elsewhere. We also purchased the official W2W map and the additional Yorkshire Moors and Coast map for Day 3, both of which were veryuseful. We both rode mountain bikes, although we did change the tyres for slightly more road based, puncture proof versions (we were plagued by punctures due to hedge cutting on the C2C route the previous year) as 95% of the route would be on roads. We drove over from Middlesbrough in the North-East and arrived at Walney Island (much bigger than we thought) on the West coast on the Wednesday morning. After much faffing about we set off at 11.30a.m. - as we had around 65 miles to go and the weather forecast wasn’t too good this didn’t leave us much time for stops etc. It wasalso further than either of us had ridden in a single day before so we didn’t want to hang around any longer. With a strong following wind we sailed back onto the mainland and easily found our way round the back of the Dock Museum and into Barrow. This was the busiest section of the ride. Our first problem came when we tried to get from Newtonthrough a place called North Stank, about 6 miles into the ride. We came across a road closed sign and the road was totallyimpassable and fenced off due to a collapsed mine shaft.Although this was mentioned on the W2W official website we assumed that it would have been sorted out as it related to July 2010 – wrong! After much head scratching and consulting the map we made a diversion which probably cost us 20 - 30 minutes, time we would later wish we hadn’t lost as we ended up riding in the dark trying to reach our day 1 finish. Back on track we passed Furness Abbey and Ulverston before crossing over the Ulverston Channel and the first off-road section. We then had the first big, long climb of the day at Bigland. Passing through Cartmel it was very tempting to stop off to sample the delights of its famous sticky toffee pudding – although in need of the energy boost we decided to press on. It had been raining on and off steadily most of the morning but it suddenly got very heavy as we pulled into our lunch stop at Grangeover Sands. Taking shelter for half an hour we ate then decided to press on despite the rain, we got a mile or so when it started to rain very heavily; my brother commented that it was like having buckets of water thrown at him! We stopped and sheltered briefly under some trees before deciding that in view of the time and the distance to go we had better continue, regardless of the weather. More ups and downs followed, some short and sharp, others just long drags. We then made another mistake which was to cost both in terms of time and energy. Shortly after Oxenholme the route crosses the A684 at staggered cross-roads; we either missed the sign directing us across the A684 or got complacent. Either way we ended up following the very busy A-road uphill towards Sedburgh for about 3 miles before we realised our mistake. At this stage our only option was to continue for another few miles past the point where the A684 crosses the M6 and turn left (north) to Beck Foot where we re-joined the original route. Feeling somewhat deflated we then followed a minor road running parallel to the motorway, through some beautiful scenery in the valley bottom. The light was by now fading fast as we skirted Tebay and headed for Orton, our overnight stop. Riding in total darkness we were running on empty and my brother was starting to struggle up the hills (which were the steepest of the day). Every light we saw in the distance that promised to be our destination cruelly let us down - on reaching it when we discovered it was just a solitary farmhouse. We eventually rolled into Orton at 8.15, had a swift drink in the village pub and raced to Mostyn House, the B & B, where we were staying. After a quick shower we returned to the George Hotel which served very reasonably priced, wholesome food and good beer. They kindly waited for us and served us with food, despite officially having finished serving food for the evening. We shared our breakfast table and tales of the steep hills andtorrential rain with 3 couples who were doing the Coast to Coast walk which passes through Orton. Then, fuelled by oursubstantial cooked breakfast we took a short stroll round the pretty village of Orton to loosen up - remarkably, our legs felt fine. At around 9.30a.m. we set off towards Kirby Stephen,the only major point where the Coast to Coast walk crossed our route. We stopped to buy sandwiches for our lunch at the large Co-op just outside the village centre before continuing on the long steady climb towards the Tan Hill Inn, England’s highest pub and the highest point on the ride. Having studied the profile map of the route in the pub the previous night we were a little apprehensive about the climb that lay ahead of us – it looked near vertical! We needn’t have worried however as it was all fairly steady and probably less energy sapping than the constant ups and downs of the day before. A strong tail wind helped us up the last steep hill. Arriving at the pub we stopped for a pint and ate our lunch sheltering from the wind behind a rock. Almost immediately after Tan Hill was the first proper off-road section of the ride. Although it was only a few miles long we were certainly glad of our fat mountain bike tyres. After this we seemed to get a few “free” miles as we coasted towards in a downhill direction towards Barnard Castle. Unfortunately, there was a sharp uphill section just after Bowes. It seemed to take an age to arrive at Barnard Castle though and it was quite a shock to the system to have to navigate busy streets with cars again after so long on quiet, almost deserted roads. A word of warning to those doing the W2W (Wear) route – just after you cross the footbridge over the River Tees on the outskirts of Barnard Castle you will cycle up a track/path heading towards the castle, which runs parallel to the river,before coming out at the top on a street with houses on. The first W2W sign which you see straight in front of you is for the northern strand of the route (via Hamsterley Forest ) – if you are doing the southern strand of the route (via Bishop Auckland) then the sign for this is 50m up the road. It would be easy to miss this and blindly follow the first sign. As it was we weren’t taking either of these routes so we negotiated our way through Barnard Castle centre, heading towards Whorlton. At this point we switched to the Yorkshire Moors and Coast map, which is only required if you are going on to Whitby. Our day 2 overnight stop was in Darlington at Trudy's Guesthouse. Although this was about 4 miles off route we felt it was the obvious choice as there no reasonably priced alternative accommodation anywhere else. Also there were plenty of places to eat and enjoy a post-ride pint! After another hearty breakfast we dragged ourselves out into the cool morning air and set off from Darlington to get back onto the W2W route at Croft. We had missed out a small section of about 1-2 miles between Stapleton and Croft due to our diversion to the B & B but since we had already cycled 4.5 miles to get back on route we didn’t feel we needed to do any more to make up. The next 20 miles or so to Great Ayton were are all quite flat and followed through some pretty, mainly agricultural, land with high hedges. As we passed through Seamer we were about 3 miles from my home and it was tempting to divert again for a coffee but we decided to carry on to Great Ayton as I knew there would be shops there where we could get something for our lunch. We arrived at Great Ayton for about 1pm, bought some food, took some photos and decided to press on a bit further as we didn’t feel hungry just yet. Once we reached Kildale we knew that the hills were back and we had a couple of long drags before we reached Castleton, via a nice, if slightly bumpy, off road track. We sat in the centre of the village, watching people pass by, eating our sandwiches and generally stretching our now aching legs. Then, due to my inability to do simple maths, we had a nice surprise – I had told my brother and convinced myself that we had another 30 miles to go after Castleton. However, on consulting the map it turned out to be more like 20. Buoyed by this we set off in the sunshine, following the line of the railway towards Whitby. More steep hills followed and after one particularly long climb we were quite pleased with ourselves as we had managed to overtake a couple of roadies on the long grind up. We stopped and waited for them and talked for awhile. 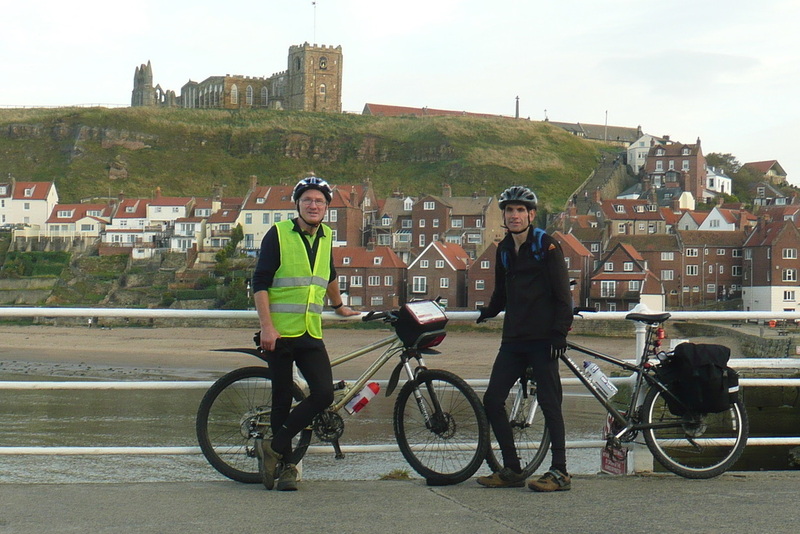 It turned out they were father and son on a day ride from Whitby – these were only the second set of touring cyclists we met on the whole ride. 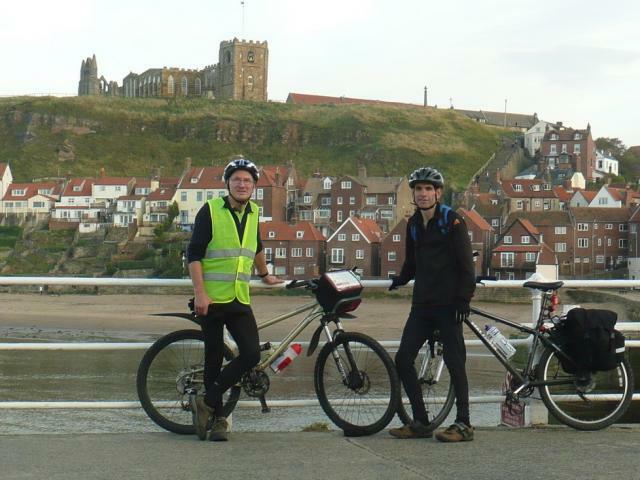 We bade them farewell and moved on towards Whitby through some pretty villages and some very impressive scenery, again different to what we had seen on Day 1 and 2. The hills became more rolling and less of a problem now that the end was in sight. At Aislaby we had one last off-road section (mountain bike recommended) that took us down into Ruswarp. 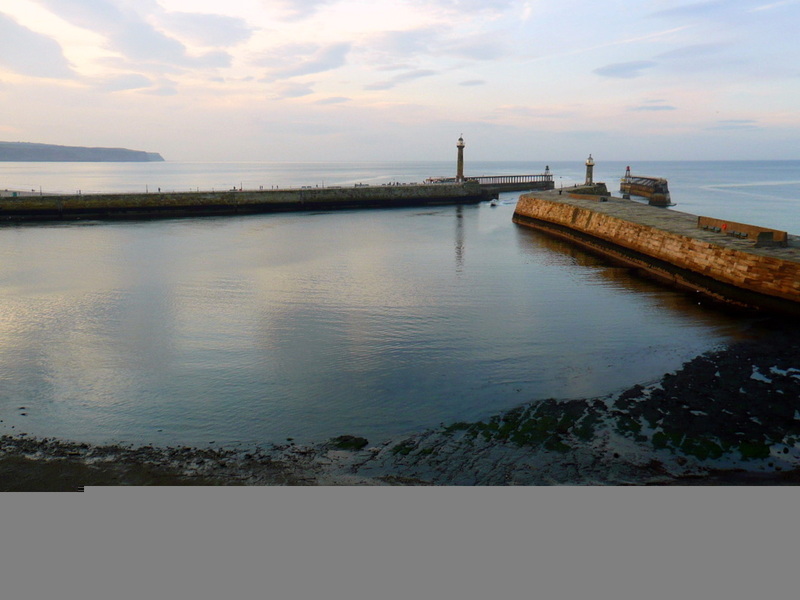 After taking some photos from the road bridge overlooking the inlet of the River Esk and Whitby harbour, followed by a bit of head scratching as we tried to relocate, we set off again to find the disused railway line (called the “Cinder Track”). Once we had found this it was a simple, if slightly busy, roll in to the finish at the pier at around 5.30pm. We stopped for photos and to congratulate ourselves then rode off over the swing bridge to the other side of town where we got fish and chips. We pushed our bikes through the very quaint, but remarkably busy for the time of the year, old town, and sat near the foot of the 199 steps, just below the Abbey, watching the sun go down, reflecting on our adventure and thinking about our next adventure. In all we had been on the go for around 8-9 hours every day, which probably included around an hour or so for stops and had covered, according to my estimation (as my brother’s trip computer battery went flat half way into day 1), around 200 miles allowing for diversions and map reading errors, with over 10,000 feet of climbing – with a fair chunk of this on the first day. 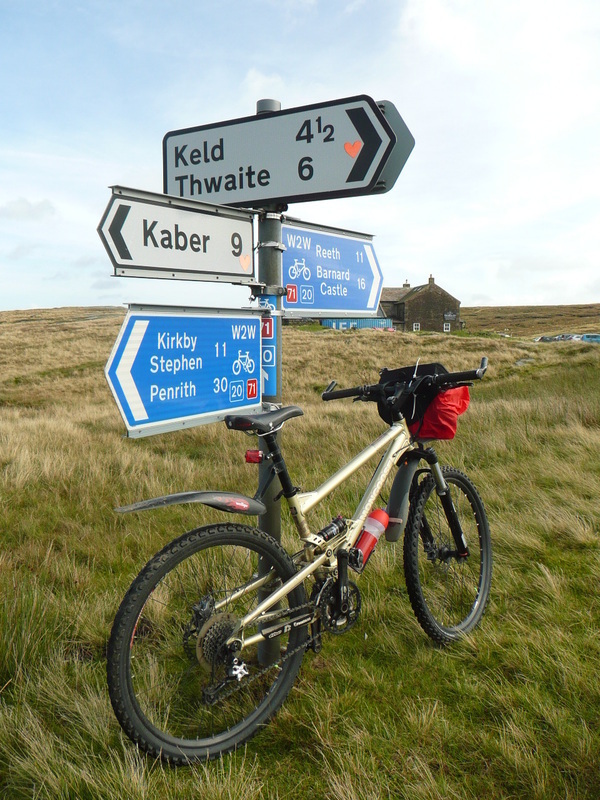 All in all a thoroughly enjoyable trip and one which I can highly recommend, particularly if you have done the original Coast to Coast (C2C) ride and want to try something different – for me, the version we did, was probably a bit harder and possiblymore scenic. • Allow longer than you think on Day 1 – particularly if going to Orton – those ups and downs just keep on coming – don’t underestimate them! Footnote: - A few months later I was passing through Ruswarp for work so I made a short diversion up the road, and the 1 in 5 hill, where we had gone wrong on the ride. Just before the top of the hill there is the arch of a railway bridge. To the left of this is a short footpath which leads up onto the viaduct and the old railway line into Whitby. The wooden signpost pointing up this path had fallen over and therefore probably wasn’t seen by us as we huffed and puffed up the hill. This has been reported to Sustrans so hopefully it will get fixed shortly. 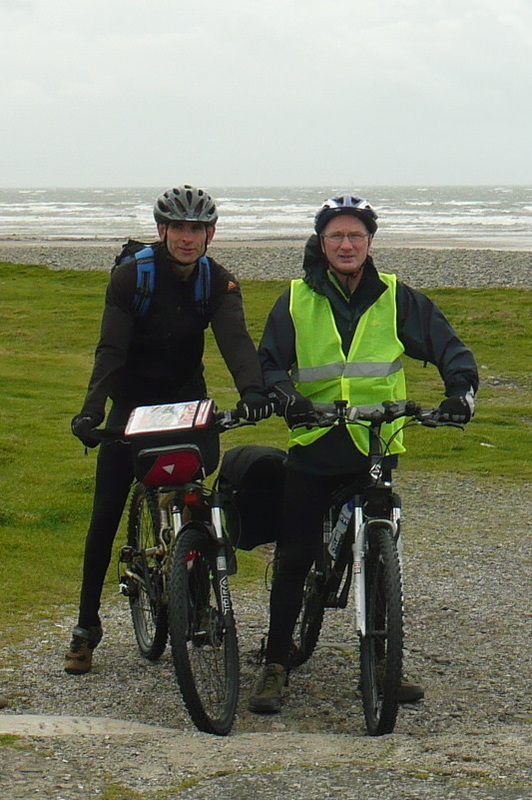 ← Walney to Whitby by tandem in 3 days.